The Cat 745C with a 25 m3 (32.7 yd3) 41 tonnes (45.2 tons) increased capacity offers proven reliability, durability, high productivity, superior operator comfort and lower operating costs. With a focus on high productivity, the 745C has many updated and improved features, an all new power train and new ease of operation features including Automatic Retarder Control. High machine performance across a variety of applications. Enhanced reliability through commonality and simplicity of design. Maximized uptime and reduced cost with world-class support from the Cat dealer network. Minimized impact of Emission Systems: designed to be transparent to the operator without requiring interaction. Durable designs with long life to overhaul. Delivering better fuel economy with minimized maintenance costs while providing the same great power and response. Advanced MEUI-C injector platforms deliver increased injection pressures and more precise fuel rates. These durable injectors enhance responsiveness while controlling soot. Cat engines feature innovative air-management systems that optimize airflow and enhance power, efficiency and reliability. The engine compression brake improves retarding response and increases retarding power for controlled descent of grades. The new Cat High Density Power Shift (HDPS) nine-speed forward two-speed reverse transmission, designed specifically for Articulated Trucks, features Advanced Productivity Electronic Control Strategy (APECS) and Electronic Clutch Pressure Control (ECPC), which deliver smooth gear changes, improved acceleration and higher productivity. Rimpull has been increased in both forward and reverse. Speed hold/limiting function allows the machine speed to be limited in 1 kph or 1 mph steps to conform to site speed restrictions. Gearshifts have been significantly improved to maintain direct drive lock-up, and eliminate dropping into converter drive. Reducing the use of torque converter drive helps maintain ground speed and gradeability. Variable shift points used based on the operating conditions, which also aid in maintaining ground speed during gear changes on grades. Larger diameter torque converter, configured for off highway applications, allows the higher engine power to be transmitted more efficiently to the lower power train. The ATC system successfully introduced on the B Series has been further enhanced for even better performance. Application of the inter and cross-axle differential locks is ‘on-the-go’ and fully automatic. The operator does not have to think about when and where to engage either diff lock. Sensors monitor the machine and wheel speeds, enabling instant response in low traction conditions. Operation is seamless and smooth, eliminating wheel slip for maximum traction and therefore productivity. Clutches are automatically disengaged when ground conditions allow, maximizing efficiency when steering or on uneven ground. ATC reduces tire and driveline abuse, eliminating lost efficiency caused by improper manual operation of the differential clutches, and reducing the cost of premature tire replacement. In automatic mode, use of the retarder is much easier for the operator. As with ATC a number of machine operating aspects are monitored, and if required the engine compression brake is engaged automatically. The system can help towards eliminating engine overspeed, improving safe machine operation and reducing cycle times, yet still with the flexibility of manual control if needed. The three-point front suspension oscillates ±6° to provide a smooth ride, allowing the operator to travel at speed over rough terrain and softening impact loads on structures and components. Large bore, low-pressure cylinders are purposely designed for tough applications and offer a soft, smooth ride. The front suspension uses an oscillating A-frame with a lateral tie rod to control axle sideways movement and stability. Features a walking beam with Caterpillar designed rear suspension mounts, which have long life and provide a reliable, and stable ride for excellent load retention. Suspension mounting points are integrated into the axle housing, increasing reliability. Provide smoother retarding and braking, with improved holding in slippery conditions and on grades. Eliminates potential ‘roll-back’ on grades. If an operator stops the machine on a grade, when taking his foot off the service brake pedal the machine will automatically hold the service brakes on for a number of seconds to prevent the machine from rolling backwards. The three-point front suspension with its oscillating axle and low-pressure ride struts, combined with the center-mounted cab, offers unrivaled levels of ride comfort for the operator in all driving conditions. The operator remains comfortable and productive throughout the day. The large two-person cab, offers a comfortable working space for both the operator and a passenger. The passenger seat is fully padded with a backrest and a wide, retractable seat belt for a secure and comfortable ride. It is also positioned adjacent to the operator, giving both the operator and passenger a clear view of the instrument panel, controls and the road. The storage space behind the operator seat has been increased, and access improved. The design and layout is common across all C Series Articulated Trucks. The air suspension seat provides improved operator comfort with a cushioned upper high back, adjustable damping with three settings, ride zone indicator and adjustable lumbar settings. It is fully adjustable to provide the optimal driving position. The air conditioning system helps to keep you comfortable whatever environment you are operating in. As the name implies, anywhere you are waiting you can use this feature to remove the need for repeated application of the parking brake. For example, if you are holding the machine on a grade, in a loading or dump area, select neutral and press the yellow button on the gear select cane. This will automatically apply the service brakes, without the need to apply the park brake. To disengage, put the machine in gear and the brakes are automatically released. The cab is designed to make all aspects of machine operation as simple as possible. The controls and gauges are easy to read and straightforward to operate, the controls and gauges allow the operator to focus on safe machine operation while maintaining productivity. The integrated wrap-around dash puts all controls within easy reach of the operator. Featuring LED illuminated rocker switches for the dash dimmer, rear wash wiper, hazard warning, work lamp, secondary steer, A/C and cigar lighter. Delivers an automotive feel with the industrial strength you would expect from Caterpillar. The dash mounted display unit shows the operator various levels of performance and condition pages as well as machine warning categories. These include performance data, configuration settings, operator and machine totals, service information, various machine status parameters, machine payload Information (when fitted), and the video feed from the rearview camera. Make and receive calls via Bluetooth equipped mobile. The front frame design features a large box section and wide, stiff frame beams to handle torque loads. The divergent frame design decreases stress in the hitch area and optimizes suspension geometry. The frame design makes maximum use of robotic welding for increased durability. Twin-box construction minimizes stress concentrations and provides low weight with long service life. The three-point oscillating axle front suspension provides unparalleled ride quality. It also protects the truck from adverse road conditions by absorbing shock loads that would reach the frame. The articulating hitch provides the truck with steering articulation, and the oscillation ensures all-wheel ground contact in rough terrain. Field proven two-piece construction features a durable cast steel head bolted to a hard wearing forged steel tube. The 745C has a large target area to provide consistently high load-carrying capacity. Its diverging flow design gives clean material discharge, which maximizes production and avoids the waste of carry-back. Distributes drive to the tractor and trailer and includes a wet clutch differential lock for optimum traction in poor underfoot conditions. Dual-circuit, all wheel braking system. The full power hydraulic system actuates enclosed, oil immersed, multi disc, multi plate brakes with independent front and rear circuits and accumulators. Located on the center axle in an elevated position, it is spring applied and hydraulically released. - enhance job site awareness to keep your people and equipment safe. LINK technologies, like Product Link wirelessly connect you to your equipment, giving you valuable insight into how your machine or fleet is performing. The system tracks location, hours, fuel usage, productivity, idle time, and diagnostic codes through the online VisionLink user interface so you can make timely, fact-based decisions to maximize efficiency, improve productivity, and lower costs. 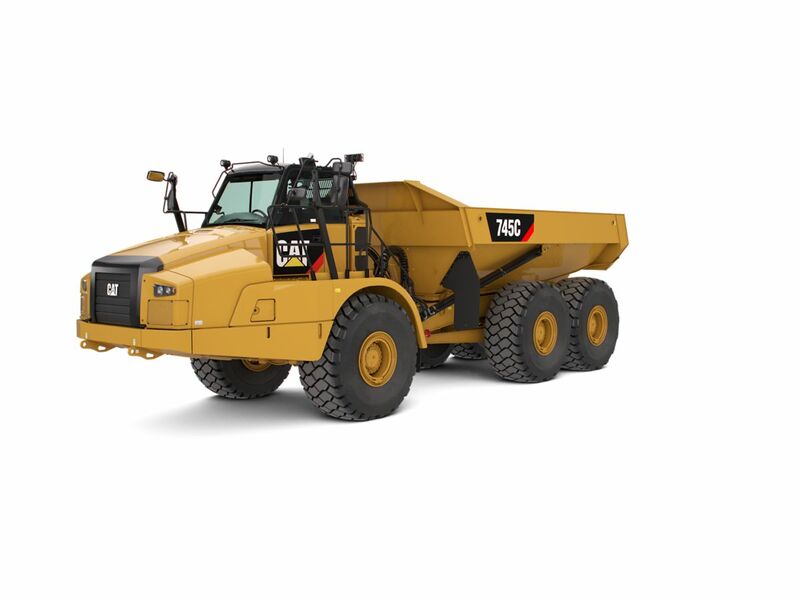 PAYLOAD technologies like Cat Production Measurement bring payload weighing to the cab to help optimize job site efficiency and productivity. Operators can view real-time load weights on the integrated display and know precisely when target is achieved, while cab-mounted external payload lights signal the loader operator when to stop loading to reduce overloading. Operators can track daily productivity from the cab, with quick access to truck payload weights, loads and cycle counts, and daily totals; or remotely via LINK technologies. Changes to oil change intervals, volumes and the type of oil required will help lower maintenance costs and machine downtime. Lubrication points are grouped in the hitch area for ease of servicing. Universal joints are lubed for life, eliminating any maintenance. An Autolube system is also optional, and now includes alerts via Product Link for low grease levels. The radiator package is located behind the cab, which provides protection from frontal impacts and offers easy access to the inlet and outlet sides of the radiator. Extends the change interval and improves component life by reducing aluminum corrosion. Located inside the cab, this service center provides a power port, diagnostic connector and Cat Data Link connector. The Cat Data Link connector provides a plug-in using a laptop with Electronic Technician (ET) software. The cab tilts to the side to provide easy access underneath, which simplifies access to the transmission, drive shafts and hydraulic pumps. Machine electrical and hydraulic interfaces are located on the right side of the cab, behind a removable body panel for easy access. The suspension system eliminates the need to lower the suspension when transporting the truck, reducing maintenance and downtime. Make comparisons of the machines you are considering before you buy. Your Cat dealer can help. Consider the resale value; compare productivity and day-to-day operating costs and fuel consumption. For the best operating techniques to increase productivity and your profit, turn to your Cat dealer for the latest training literature and trained staff. Repair option programs guarantee the cost of repairs up front. Diagnostic programs such as S·O·SSM and Technical Analysis help you avoid unscheduled repairs. Repair or rebuild? Your Cat dealer can help you evaluate the costs so you can make the right choice. Your local Cat dealership will be with you every step of the way with its unsurpassed worldwide parts support, trained technicians and customer support agreements. For more complete information on Cat products, dealer services and industry solutions, visit us on the Web at www.cat.com. All Cat Articulated Trucks are designed to maximize efficiency and productivity while conserving natural resources. The amount of both hydraulic and engine oil required has been lowered, reducing waste oil disposal. The Caterpillar Design, Manufacturing, Assembly and Test Site at Peterlee in England recycle 98% of all waste produced with zero waste to landfill. Rebuild and reman are designed and built in to all Cat C Series Articulated Trucks. This gives machines a longer life while reducing waste and replacement costs. Caterpillar has been and continues to be proactive in developing machines that meet or exceed safety standards. Safety is an integral part of all machines and system designs. Electro-hydraulic secondary steering system automatically activates in forward/reverse or when stationary if low pressure is sensed. Can be manually selected for machine recovery purposes. Note Dimensions are for machines equipped with 29.5R25 tires. Storage: cup holder, flask receptacle, under seat storage, door pocket, behind seat storage, coat hook.